South Edmonton Common, the project that put Edmonton’s Cameron Developments on the map, opened the doors of its first retail big box 20 years ago. The retailer was Home Depot (HD-N). Since that time, Cameron has built out the 320-acre power centre site with 2.3 million square feet of retail development. The private, family-owned firm has 14 retail developments underway, and has participated in transactions involving more than eight million square feet of development. As the years have passed the company has branched out, dividing off homebuilder Cameron Homes in 2002, residential developer Cameron Communities in 2011, and its multi-family division Cameron Lifestyle in 2014. It’s a long way from the company founded by current CEO Jerry Naqvi, Tina’s father. Jerry, an engineer who arrived in Canada from Pakistan in 1964, started in the development business with Dr. Charles Allard, a titan in the Edmonton business community. When he went out on his own in 1980, his firm’s bread and butter was grocery store-anchored strips, one-off banks and standalone retail such as Tim Hortons (QSR-T), says Tina. His early projects grew thanks to relationships with reliable brands such as Walmart (WMT-N) and Aikenhead’s Hardware, a brand which was taken over by Home Depot. In fact it was another Home Depot outlet, which Jerry had sited in Edmonton’s first small power centre in the northeast of the city, which sparked the creation of South Edmonton Common. Home Depot wanted a southern location and Jerry was eyeing a large parcel owned by CP Rail (CP-T) on the southern edge of the city. He bought it, erected a 130,000-square-foot Home Depot, a 130,000-square-foot Walmart, a small McDonalds (MCD-N) restaurant and was still left with plenty of empty land. “People thought we were crazy and we thought we were crazy, too,” says Tina. “My family bet the farm on this one project. Every single penny we had went into this one project. We sold other assets . . . grabbed the money and put it into this one dream that we had. The development was not without controversy. There were community complaints about the cost of road interchanges around the power centre to accommodate the vast increase in traffic. However, Tina says relationships with the city government and city administration remained cordial throughout that contentious time as the 23rd Avenue interchange was hammered out. She also points out the city had planned a beefed-up interchange for 23rd Avenue in the 1970s, but shelved it due to a slow economy. Cameron has focused its business on the Edmonton region and, just as it forged relationships with retailers, it forged relationships with city government. Those kind of discussions come naturally to Tina, who like her father, is an engineer. She never thought she would go into the business. Neither did her brother Cameron nor her sister Rose, she says, but they are all now executives with the family business. South Edmonton Common has only two small parcels of land left, one of which could handle about 8,000 square feet and the other about 5,000 square feet, says Tina. However, new doors will still be opening with redevelopment, consolidation and updating. This year Nordstrom Rack will open in the Common on Oct. 25. “We selected South Edmonton Common because of its great mix of retail offerings, as well as its convenient location in Edmonton,” according to an email statement from the Nordstrom company. 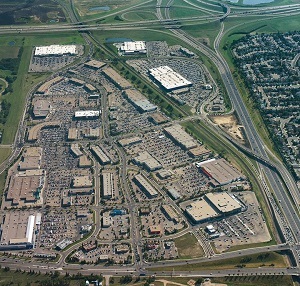 The South Edmonton Common location will be the only Nordstrom in the city, says the company. The Naqvis broke ground on the power centre concept and plan to continue innovating with new retail and multi-use trends. At The Currents of Windermere, an upscale development in the city’s southwest, Cameron plans a community square space to complement the existing retail and entertainment offerings. “That’s more the next rendition of what the power centre is moving into — an urban village or town centre kind of project,” says Tina. The Currents of Windermere offers the usual big box draws but also entertainment such as a Cineplex (CGX-T) and restaurants and, soon, a town square. It will be a place to families to grab a coffee, children to play around. There might be a big Christmas tree in December, concerts and programmed events. Harold Pacheco, marketing manager for Cameron, says that community centre idea follows the shift of retail to be less transactional and more about relationship-building. Cameron also has a community-focused project underway in Sherwood Park, a community east of Edmonton which has grown up without a centralized downtown. Cameron hopes to change that with their Centre in the Park, a mixed-use development with 40,000 square feet. of retail below 80 rental units. Cameron is also undertaking a transportation-oriented development called Clairview Village in northeast Edmonton at the north end of the city’s LRT system, which will integrate residential and walkability. Pacheco says Cameron will continue to modernize and follow the curve. As an example, he says, the company has begun to install electric vehicle charging stations in its developments.